Animals that climb up vertical walls and walk up side down on ceilings owe this ability to micron and nano scales attachment elements. There are a variety of mechanisms employed by these animals: tiny claws, adhesive secretions, smooth and hairy adhesive pads, etc. The highest adhesion forces are encountered in geckos. 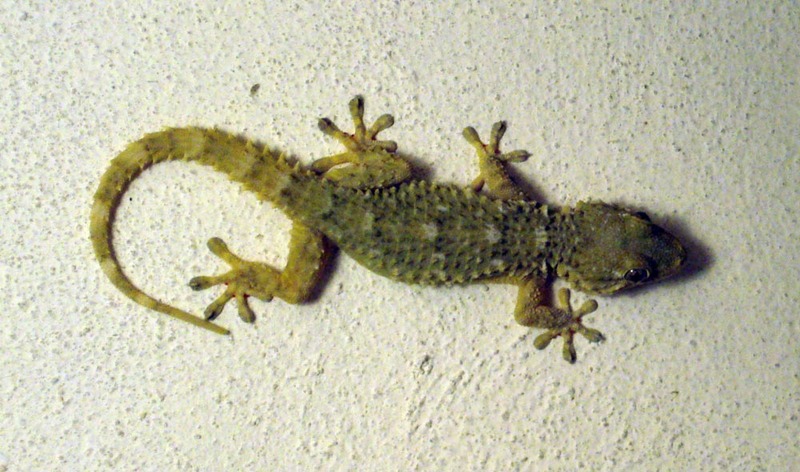 A gecko walks up walls using physical adsorption forces. The gecko’s ability to walk up walls stems from special structures on their feet called setae ( made of keratin). Robert Full of the University of California, Berkeley, discovered that the adhesion was due to van der Waals forces ( From Wikipedia: “Van der Waals forces include attractions between atoms, molecules, and surfaces. They differ from covalent and ionic bonding in that they are caused by correlations in the fluctuating polarizations of nearby particlesphysical adsorption forces”). Each seta is 1mm long and 5µm in diameter, terminating in hundreds of fine structures called spatula, which are 200nm long and 10nm in diameter. 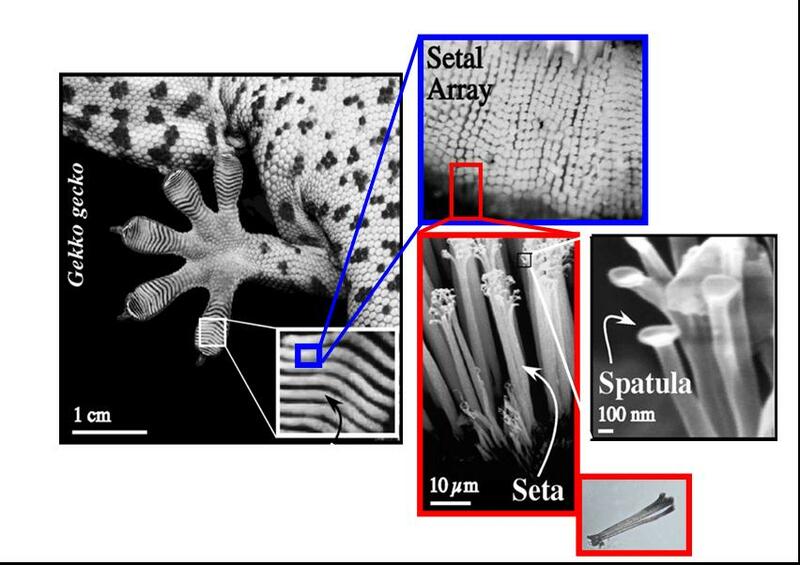 In the case of gecko feet, the spatulae are so small and get so close to the surface that an attractive van der Waals force of around 0.4 µN develops between a single spatula and a surface.
. So a gecko has 400mm2/0.025kg=16,000mm2/kg. Andre Geim discovered that capillary forces (capillary forces are attractive forces created by the surface tension of a molecular layer of absorbed water that forms between two surfaces) also contribute to the adhesion. Researching how insect and gecko feet have evolved to optimize adhesion strength is leading to bio-inspired development of artificial dry adhesive systems. The Big Bang theory explains the beginning of the universe’s expansion, what happened during and after that moment. According to the standard theory, this theory states that the universe began from an initial point (singularity: zone of infinite density), which has expanded over billions of years ( around 13.7 billion years ago) to form the universe as we now know it. In 1922 Alexander Friedmann of Russia is credited with developing a dynamic equation for the expanding universe. We are taught that the universe began as a singularity – an infinitely small and infinitely dense point. Once the singularity was created, it began to expand through a process called inflation. After that, it expanded and cooled, going from very small and very hot, to the size and temperature of our current universe. Astronomers observed the relationship between the number density of distant radio sources and quasars( quasars are intense sources of X-rays as well as visible light) and the energy received from them per unit area per unit time have discovered new evidence about the rate at which the universe is expanding. The research shows a slow enough expansion to explain the ages of the oldest globular star clusters, as long as the universe has a low density. Stockton observed faint galaxies near in the sky to bright quasars at moderate redshifts. The redshift of an object is the amount by which the spectral lines in the source are shifted to the red. Quasars are associated with galaxies that have the same redshift as the quasar and have just the brightness expected if the quasars are at their cosmological distances. The redshift caused by the expansion is often confused with the redshift generated by the Doppler effect. The Doppler redshift and the cosmological redshift are governed by two distinct formulas. The first comes from special relativity; the second comes from general relativity. If the redshift is interpreted as a Doppler shift, the recessional velocity of the object can be calculated. In an expanding Universe, distant objects are redshifted, with for small distances. This law was discovered by Hubble and is known as the Hubble constant. At large distances, the conversion between cosmological redshift and distance is much more complicated, depending on the geometry of spacetime and the expansion history of the Universe. The universe had a beginning. Galaxies appear to be moving away from us at speeds proportional to their distance. This is called “Hubble’s Law,” named after Edwin Hubble (1889-1953) who discovered this phenomenon in 1929. This observation supports the expansion of the universe. In 1965, while tuning a small, yet very powerful and highly sensitive horn antenna for conducting radio astronomy experiments, Arno Penzias and Robert Wilson noted a constant low level noise disrupting their reception. They discovered a 2.725 degree Kelvin (-454.765 degree Fahrenheit, -270.425 degree Celsius) Cosmic Microwave Background radiation (CMB). The Universe’s light-element abundance is another important criterion by which the Big Bang hypothesis is verified. 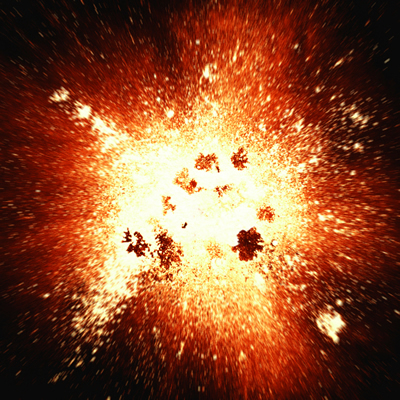 Light elements (namely deuterium, helium, and lithium) were produced in the first few minutes of the Big Bang, while elements heavier than helium are thought to have their origins in the interiors of stars which formed much later in the history of the Universe. It is observed that upwards of 25% the Universe’s total matter consists of helium. The Big Bang Nucleosynthesis theory predicts that 25% the mass of the Universe consists of Helium. It also predicts about 0.01% deuterium, and even smaller quantities of lithium. The important point is that the prediction depends critically on the density of baryons (ie neutrons and protons) at the time of nucleosynthesis. Measurements of the baryon density in the Universe using the cosmic microwave background spectrum and primordial nucleosynthesis constrain the baryon density to a value less than 0,05. There are a number of free parameters in the Big Bang model must be fixed by observations of our universe: the geometry of the universe (open, flat or closed); the present expansion rate (the Hubble constant); the overall course of expansion, which is determined by the fractional density of the different types of matter in the universe. A physicist, biologist and a chemist were going to the ocean for the first time. The physicist saw the ocean and was fascinated by the waves. He said he wanted to do some research on the fluid dynamics of the waves and walked into the ocean. Obviously he was drowned and never returned. The biologist said he wanted to do research on the flora and fauna inside the ocean and walked inside the ocean. He too, never returned. The chemist waited for a long time and afterwards, wrote the observation, “The physicist and the biologist are soluble in ocean water”. structures), from chemically-synthesized nanostructures ( objects that have a physical dimension smaller than 100 nanometers) to superconductors ( materials that have no resistance to the flow of electricity) , from carbon nanotubes to liquid crystals… and so on! Microscopic observation of the trapped clouds of bosonic and fermionic atoms have led to developments and progress in these fields. All fundamental particles in nature can be divided into one of two categories: Fermions or Bosons. Bosons have intrinsic angular momenta in integral units of . Many bosons can occupy a single quantum state. Any object which is comprised of an even number of fermions is a boson, while any particle which is comprised of an odd number of fermions is a fermion. Only one fermion can exist in a given quantum state. 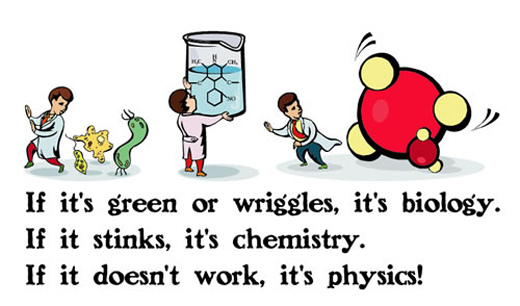 This is known as the Pauli exclusion principle.